The chimichanga is not only delicious, but is also an incredibly fun word to pronounce. Saying “chimichanga” is almost as enjoyable as eating one. And for as much love as chimichangas get nationwide, what is a chimichanga, and where did it come from? Well, chimichangas are no more than a deep-fried burrito. All one has to do is fill a tortilla with whatever ingredients suit their fancy, and then fry it. Their origin is debated: one Tuscon, Arizona chef claims she accidentally dropped a pastry into a deep fryer in 1922 and exclaimed “chimichanga” which means “thingamajig,” while another chef claims that he first experimented putting burritos in a deep fryer in 1946. Do you want to experience the delight of a chimichanga? 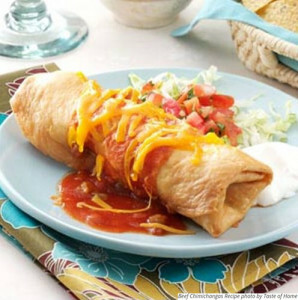 Check out this beef chimichanga recipe from Taste of Home! Spoon about 1/3 cup of beef mixture off-center on each tortilla. Fold edge nearest filling up and over to cover. Fold in both sides and roll up. Fasten with toothpicks. In a large saucepan, combine the chilies, peppers and remaining tomato sauce; heat through. In an electric skillet or deep-fat fryer, heat 1 in. of oil to 375°. Fry the chimichangas for 1-1/2 to 2 minutes on each side or until browned. Drain on paper towels. Sprinkle with cheese. Serve with sauce. Yield: 1 dozen. Delicious beef chimichangas are as simple as that! If you want to learn how to make more Mexican delicacies, check out our blog. If you just want to eat delicious Mexican food without having to deal with the hassle of preparing it, stop on in to Mexicali Fresh Mex Grill! We have locations in Connecticut and across Massachusetts.